A weekly newspaper has announced it will no longer be based on its patch, with reporters set to meet members of the public in cafes. The Gloucestershire Gazette has announced the closure of its office in Dursley, telling people it will now be based at the headquarters of Newsquest sister title the Stroud News and Journal, ten miles away. 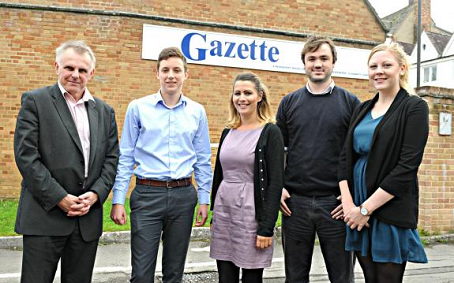 The paper has said that its current base in Long Street, Dursley, is “too big” for the number of staff at the Gazette, where they take up less than one-fifth of the available space. But it said its reporters will now be based on the patches they cover “more often”, with regular surgeries planned in local cafes. Gloucestershire Gazette journalists, from left, Gary Baker, Josh Wright, Ali Womack, Stuart Rust and Bethany Wash pictured outside their Dursley office which they are leaving. In a story about the office move, editor Michael Purton said: “We are sad to be leaving the Long Street office after so many years in Dursley but it has simply become far too big for us – we take up less than a fifth of the available space. Michael became editor of the Gazette earlier this year, along with sister titles the News and Journal and the Wilts and Gloucestershire Standard. The office closure comes after HTFP revealed this week that another Newsquest title, the Bridport News, is set to leave its long-standing office in the town. The Gazette’s story gives contact details for the journalists currently based at the Dursley premises and ‘surgery times’ for when people can drop in to meet them. Thornbury reporter Bethany Wash will be based at a cafe bar in Thornbury for three hours each Monday and Tuesday, while Stuart Rust, who covers Dursley and Wooton-under-Edge.will be at a cafe in Dursley on the same days. Two other reporters at the title, Alexandra Womack and Josh Wright, live in the areas they cover so will be available to see readers all week, while sports editor Gary Baker will be regularly visiting the areas and clubs he covers. …..And someone said there was still a future for young people coming into the industry…. What sort of message does this give to the town, its readership and indeed its staff? Smacks of either indecisiveness and fence sitting by those in charge or a gradual closure and running down of this paper to me. If the locally based reporters are, in effect, going to be working from home their employer needs to be paying towards their heating, lighting, telephone and broadband bills. Newsquest tried to close and sell all three offices in the group a couple of years ago. The idea was to make everyone move to rented offices in Tetbury. It fell through. They weren’t even able to sell one. I’m sure distressed (possibly even recently bereaved?) members of the public will just love having to tell a reporter their problems in a room full of coffee/tea drinking strangers, some of whom will inevitably be sitting close enough to hear every one that’s said. And just imagine how uncomfortable it’ll be for the reporter having to conduct a decent interview in such an inappropriate environment. If I buy a contact a coffee, can I claim the money back on expenses? How do the “Suits” go on in a situation like this in the Board Room? Is it worth pointing out to Newsquest that using a table in a local caff as your place of business isn’t actually guaranteed to create a good impression? If I was Newsquest I would insist on using commercial properties that do not change in size or even, as it appears here – shape shift in a spooky haunted house way! As Michael says, the old place ‘has simply become far too big for us’. It is difficult enough these days to run a giant media company without having to also contend with contradictions in the laws of physics. Good god, where do you start with this? Do you have to ring to reserve a table? Seriously, this whole thing just looks (and is) rank amateur and strips away the reporters’ professional pride. Latte with your death notice anyone? I did this 30 years ago and all I did was put on weight. Five people a week was the best count. It was dropped, but there is always some muppet who dredges up an old and bad idea in desperation. Closing local offices is the death knell, as a look at any JP Newsquest or TM paper where this has happened will tell you. Shallow news without context or local knowledge. So what have they been doing up to now? Playing ping-pong inside their capacious premises? This “surgery” idea has already been tried nationwide by the Police, the Post Office and others, with less than impressive results. But then, we are only talking about the local (?) rag, aren’t we? If these reporters are willing to put up with this and stand smiling posing for photographs what can you say? This process is now being completely normalised and as long as reporters fall into line it will continue to do so. I wonder how the cafes in question view this new level of amateurishness ? Do they welcome the possible increase in trade? or are they likely to charge a rent for use of said tables? Does the poor reporter need to reserve a table for the whole 3 hours? and do the public need to make an appointment ? All thoughts of confidentially will go out of the window with people earwigging, and asking to pass the sugar. All shallow points admittedly but what a ridiculous situation for any local paper group to get themselves into and how embarrassing for the local reporter faced with such a farcical working environment . This really plumbs new depths of cost cutting and will give advertisers little faith in how seriously this paper is taken by its owners or in the overall quality of the business they are being asked to advertise with. And note the final insult of having the poor souls pictured outside the offices from which they’ll no longer be working. Newspaper offices in every town attract their share of oddbods, time wasters and “characters”. This will simply encourage these people to hang around even more once they get the message they can come in off the street for a warm. The only advantage of an out-of-town office was that it deterred this type of unwanted ” customer”. Mocha, this gives a very clear message to the town. If you’re not buying the paper, we’ll give you a lesser service. As the other comments have said, this is nothing new. It’s just another cost-cutting exercise by a regional publisher which is struggling to ensure that its shareholders are happy come dividend time. Oh dear – how different to the days when Peter & Michael Bailey had this title as the ‘flagship’ of the now departed Bailey Newspaper Group. As General Manager of this title in the mid-1990’s, we ran the title out of three offices; Dursley, Yate and Thornbury. 2 days in a cafe for 3 hours – how demeaning for both the staff and those who may venture in to have a latte on Newsquest expenses. In fact, why not use the money paid out as expense claims to provide a small focal point by way of an office/base for these staff. To me this ‘style’ of communication from the public to the reporters and vice versa is completely and utterly short sighted driven by people completely out of touch with the real world. I think if I were a shareholder I wouldn’t be happy to known as one where the staff work out of a caff, where the sports reporter presumably writes copy in his car parked at some bleak non league football teams car park or where the local reporter keeps warn huddling yet another instant coffee while waiting for the next lead to come through the door, presumably these reporters have done kind of password to identify themselves? Or is the Formica table in question branded up? The Manon Cafe, Fleet Street, is but a four-minute walk from the London HQ of Newsquest, so I look forward to seeing the executive team in there tomorrow, formulating their excellent plans for the future of the company over a skinny latte and a salted caramel brownie. When I was a young reporter, I remember my first editor once reading the riot act because too many of us were stopping off at the local cafe on our way back from jobs (yes, we actually used to get out of the office!). Funny how the world has changed – and not for the better. An ex-Newsquest employee of my acquaintance got bounced from cafes for using the internet wi-fi and not buying enough coffee… Good luck with that one. Why can’t this work in reverse? Use part of the spacious newspaper office as a cafe – the Coffee Press. Could work as a franchise or by hiring catering staff. Coffee shops seem to be growth area. Just meet in the caff…. It will save money……You couldn’t make it up! When will the office-bound bosses learn. Been there, bought the T-shirt – and it doesn’t work. A local paper here closed its offices only to reopen them a few months later because of the number of stories they were missing. As former colleague Paul Henderson says, Peter and Michael Bailey must be doing somersaults in their graves. If anyone had suggested 25 years ago that this would happen they’d have been laughed out the office. The Bailey Newspaper Group used to have a responsibility to the community they served. Must be great for building their team spirit,two hanging around cafes, one on windswept local football grounds, some in head office others working from home,what a grim and lonely existence they must have poor souls, you can almost feel the spirit being sucked out of them as you picture the scene. And where do the cafe dwellers go for the other hours during the day when their ‘surgeries’ are over or on the other non cafe days? Makes you wonder what nomadic address they have on their business cards or as the ‘contact us’ info in the papers? Have the top tablers who made these ridiculous decisions not thought of trying to get space in a more prestigious venue than a local caff? I guess it just shows how little importance they put on the staff or the local communities. Has the uk regional press really come to this? No doubt Newsquest is paying rent to the cafes for the space their reporters are taking. And of course they will also be contributing to the cafe’s wifi internet costs. Then there’s the cost of electricity when the reporter’s laptop or iPad runs low on battery power, not to mention the obligation to buy at least half a dozen coffees for a three hour session. As someone who had to leave papers but still occasionally freelances there, do you know what the best thing always was about them? Working with other journalists. There is nowhere better than a buzzing newsroom, nowhere. Profanity, passion, views, anger, humour – it’s beautiful. It’s not just the fun either, it’s the shared knowledge. If you don’t know who scored that goal in the 1923 cup final the sports editor behind you will. You only ralise what you’re missing when you go to work in a normal office, where, by and large, people don’t really care about much beyond their weekend plans. Having to work on your own takes about 90% of the joy away. It’s a tragedy. Sadly if Johnston or Newsquest tried such a scheme their reporters would be in barista aprons manning the expresso machines and warming up paninis. As already asked, where do you start? I flagged this on Facebook a week ago. I was trainee and chief reporter here, 87-91, then a sub (remember those, how quaint!). The Gazette, I am sorry to say, has nothing but contempt for its readers – they DO NOT MATTER. Correction, Newsquest has infected this local with its core values of strip to the bone, then saw the bone off. It’s surely short-term strategy for shareholders, but it will die as a policy, and the papers with it. Why? Because you can’t pare back beyond credibility. In Wotton, purportedly covered by this paper and a hugely disparate community to Dursley, the paper provokes snorts of disdain. As this spun release indicates, they’re not even bothering to come and sit in one of its many cafes. In all the towns they cover, there are masses of empty and cheap shops begging to be rented as local news offices. The Gazette did this before, in Thornbury and elsewhere. In my stint as district reporter for Thornbury, the paper wrote itself: a steady stream of readers brought stuff in. It made earthy, vibrant copy. And if we went out, (don’t get me started on this one) we went to SEE the police and trawl through their latest records. Even more strangely, we attended the local courts. Maybe having physical offices is not crucial though, but what certainly is are news values. Those were ditched way back. We now see new reporters simply not being given the support they might have had in the past, their curious ramblings and inaccuracies going unchecked by a system that believes sub-editing a frivolous luxury. My ongoing rant about these issues has been met with the argument from other journalists that people simply do not care about local issues any more. I wholeheartedly believe that’s wrong: if they are well-researched and drawn from a detailed web of sources, they can be dynamite – far more interesting than much of the material that makes the grade as national news. Indeed, they are the breeding ground for national news. Bottom line is that what Newsquest is working hard to create is a vacuum. Into which I wholeheartedly hope a new network of coverage will step, not encumbered by the costs of print but nonetheless focused on and centred in the local community. They must be selling ten copies a week and now half of their readership can hear the news live in the local cafe! Live news as it happens, listen to it before it is written, it’s interactive – the future is here and it comes with an all day breakfast. Just when you think the local paper world cannot get any madder we see closures being spun as positive. As an ex-Gazette reporter, this is very sad, and as somebody who is still in the business, I think it’s also likely to fail. The reporters will quickly become isolated and disaffected working on their own, and once they leave they will be very hard to replace. I don’t see the drop-in idea working, either as a news-gathering exercise or to satisfy the needs of a community. Just a great shame all round. Like so many others, I learned the basics of reporting at the Gazette before moving on and I wonder where our next generations of journalists are going to come from. Is this what they mean by a newsroom of the future ? Let’s face it it’s the next step to closing the paper citing lack of continuity support or interest and dwindling copy sales. Surely far better to house these five poor souls in head office then get them out and about the community making real contacts and proactively seeking news via face to face meetings with key local people, businesses and bodies. They’re fooling no one by believing this to be a satisfactory solution to having out grown an office, when other businesses do this they downsize to more suitable sized premises, there’s enough of them about if they really are serious about maintaining a presence in these Locales. And guys and your editors stand up for yourselves , you can’t be happy about this so speak up, you’ve nothing to lose, all credibility has gone already so it’s worth challenging. Come on then, let’s see a senior manager justify this decision….no, really, I’d like them to look us in the eye and tell us what great progress the cafe-based news-gathering revolution represents and to explain how it will increase sales. This idea is straight out of a sitcom. It was depressing enough starting to work for the Gazette under the Bailey Newspaper Group in the mid 1990s on £7,600 per annum – as a 25-year old graduate. Paul Henderson’s era was no halcyon age, believe me, and I was delighted to leave Dursley and the hellish subbing pool for daily papers (after reporting in Yate and Thornbury too) for dailies back as a reporter. But this must be soul-destroying for Bethany, Stuart, Alexandra and Josh. Don’t rate the Gazette’s chances of survival as a decent community paper. Checks date, is this 2015? Checks date, is it April 1st? What a soul destroying and bleak future and a depressing initiative for these poor people to look forward to, sitting in a cafe like bully and Betty no mates waiting for people to approach them with anything slightly newsworthy or of interest they they can turn in as copy. It will be interesting to see how long this ridiculous situation lasts before they pull the plug citing falling readerships,lack of interest or non viable publications not supported by the communities.